Looking for a way to keep your wine bottle chilled without having to worry about melting ice? The Double Walled Iceless Chiller by Wine Enthusiast features a thermal insulated design that keeps wine cold without the mess and hassle of traditional ice buckets. A modern twist on the classic wine bottle bucket cooler, the transparent BPA-free acrylic construction allows you to easily read the bottle's label without having to pull it out.Simply place your pre-chilled wine in the wine cooler and enjoy 3 hours of cold wine or champagne. There's no need to put your wine chiller in the freezer beforehand or have to worry about messy condensation. The clean minimal design of the tabletop wine cooler has a contrasting stainless steel accent rim that blends in seamlessly with any home decor. It is elegant enough for formal events yet useful for everyday use. The wine cooler bucket can be used with almost any sized bottle of red wine, white wine, or champagne. Measures 9" high x 4.75" diameter. Hand wash only. NO ICE REQUIRED - Looking for a way to keep your wine bottle chilled without having to worry about melting ice? The Double Walled Iceless Chiller by Wine Enthusiast features a thermal insulated design that keeps wine cold without the mess and hassle of traditional ice buckets. CHILL FOR 3 HOURS - Simply place your pre-chilled wine in the bucket and enjoy 3 hours of cold wine or champagne. There's no need to put your wine chiller in the freezer beforehand or have to worry about messy condensation. 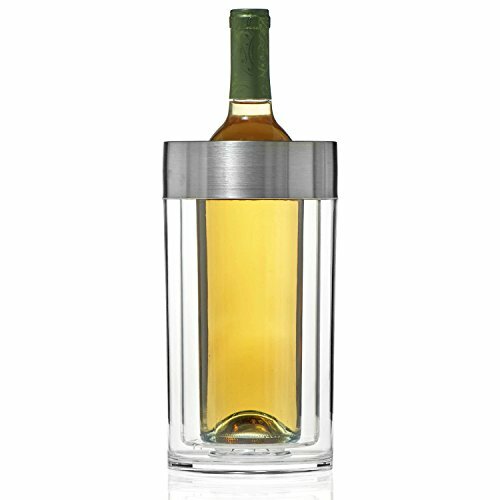 CLEAR ACRYLIC - A modern twist on the classic wine bottle bucket cooler, the transparent BPA-free acrylic construction allows you to easily read the bottle's label without having to pull it out. FORMAL OR CASUAL EVENTS - The clean minimal design of the tabletop wine cooler has a contrasting stainless steel accent rim that blends in seamlessly with any home decor, yet is elegant enough for formal events or everyday use. SPECS - The wine cooler bucket can be used with almost any sized bottle of red wine, white wine, or champagne. Measures 9" high x 4.75" diameter. Hand wash only.